I work in a broking firm and my job involves lots of travel. Due to this constant travelling, I could never focus on having a daily routine. I was under the impression that routines never work if you are going to be on the move constantly. You name it and I had all the issues. I did warm up exercises but never had an exercise regime. The only thing I did in the name of the exercise was to climb stairs instead of taking the elevator. I also did not have enough water through the day, there was a lack of sleep leave alone having quality sleep and last I did not have proper nutrition. One day as I was browsing the net for a fitness tracker and reading about fitness and nutrition, pop came a message about GOQii. I got intrigued and started reading about GOQii and tried to learn as much about it through the net. Then I contacted GOQii and got to know more. I was fairly convinced and decided to try it out. 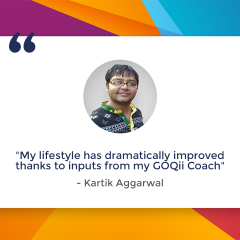 It was in Oct 2014 that I got on to GOQii platform and I am glad that I am still continuing with GOQii and my coach Sneha. My health goal when I got on to the platform was fat and weight reduction. It’s been one and half years with GOQii and I must say I am thoroughly enjoying my journey with GOQii. In so many months as I have worked hard along with my coach to achieve my health goals I have also learnt a lot about nutrition, exercising, why sleep is important and what is quality sleep etc. One always took all these things for granted. Have I achieved my health goals? Oh yes, I have. From being a person with very minimal activity and more excuses now I do at least 8000 steps a day. My exercise routine is still not up to the mark but, I am working on it. My water intake has improved. I drink 2 liters of water daily without fail. My nutrition has also improved drastically. My fast food intake has stopped and I have also stopped aerated drinks. Thanks to the constant motivation push from my coach I have been able to bring about all these changes. My belly fat has also reduced considerably but it keeps fluctuating because I am not able to exercise regularly. But we are working towards overcoming this. The other positives are also that I am into meditation and that is considerably helping in relieving stress. Overall I am positive about GOQii and my coach experience. 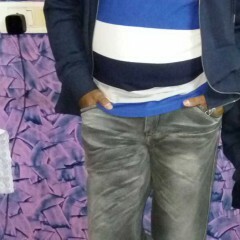 The best part is that I am also being able to do some good in the society. I have been a blood donor and every three months I regularly donate blood but now I am also able to donate my Karma points. So far I have donated 3000 points to various causes. What does coach Sneha Chikhale have to say about Vipin? It’s been more than a year now, Vipin is a part of GOQii family. 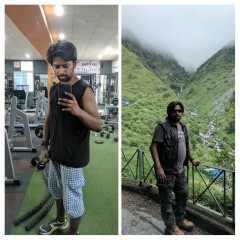 His goal was nothing but to lose few kilos and stay healthy. He was not someone who had a past history of health issues but, has always pursued a goal of staying fit and shed few kilos. Our journey started on a regular note and it became interesting as we proceeded further. 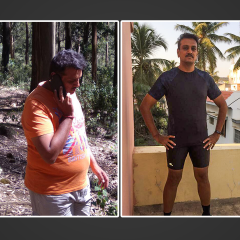 As he hailed from the southern region of India, cutting down on rice was a big challenge for him, being absolute rice eater to now moderate rice eater is one of the healthy lifestyle change we made in this ongoing journey which has also helped him lose fat. The inclusion of mid meals has also made an impact on his overall eating patterns. There was a time, when he has lost a band and till the time he did not get a new one, we continued our coaching for a certain period without the band because he was totally motivated. Losing the band had not deterred him from losing his motivation. 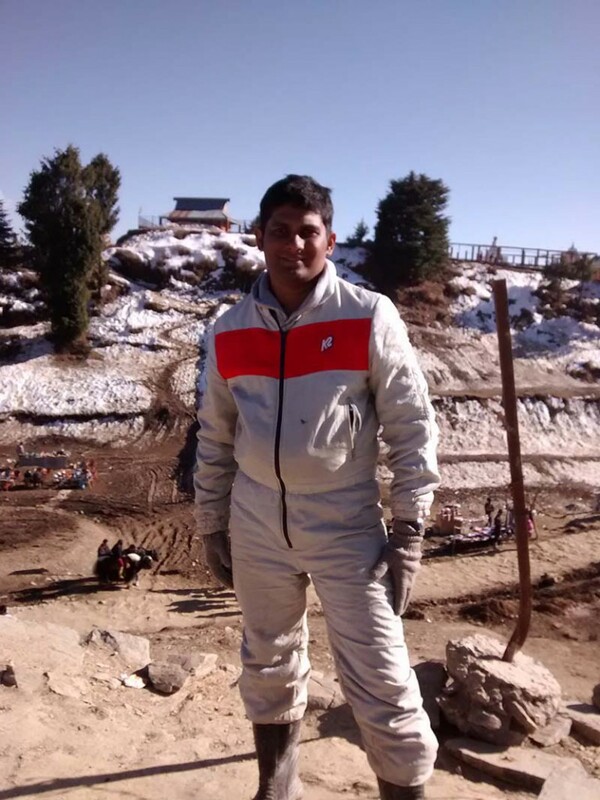 The best aspects about Vipin is that he has been a very active GOQii player, who maintains a regular connect with me on the app. This kind of connection between the coach and the player is very important for achieving the health goals. We are currently working with his sleep and stress patterns. I am sure, that like the other goals, he will be achieving these as well!